The koto is a traditional Japanese stringed instrument which yields a wide variety of sounds, from percussive to thunderous to ethereal. As a classical instrument it requires much discipline and years of formal training but the ultimate goal is improvisational. This taut balance between freedom and restraint is Shoko Hikage's speciality. Shoko Hikage began playing the koto at the age of three. She has studied with masters Chizuga Kimura and Seiga Adachi and was accepted as a special research student at the Sawai Koto Institute under the tutelage of the pre-eminent composers Tadao and Kazue Sawai. There she received her Master's Certificate. She later taught at the Sawai Koto Institute of Hawaii and at the University of Hawaii. In 1997 she moved to San Francisco where she now teaches and performs regularly in a variety of ensembles and as a soloist. Shoko Hikage has often collaborated with other women koto players, performing as a duet, trio or ensemble. These syncopated and layered pieces are as amazing to watch as to hear, as the women move together in organic patterns over their instruments, making the daring and subtle music seem effortless and ever-so-intentional. Shoko Hikage's 2014 album Inishie no (roughly translated as "Ancient Times") is a collection of traditional and experimental pieces mostly arranged, composed and/or improvised by Shoko Hikage. In the case of "For the Wild Chrysanthemum" the piece was commissioned by Hikage and composed by Hyo-Shin Na. "Sakura-Zukiyo" and the title track "Inishie no" are great examples of the dreamlike quality invoked by the koto under Shoko's persuasion, while the two opening songs lend an upbeat formality. 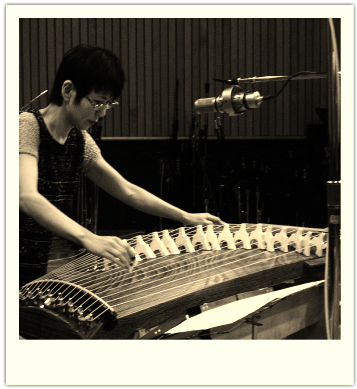 The final track, "Improvisation in Ohri Scale", is a complex and at times delicate experimental piece involving three other women koto players- Mariko Daugherty, Kanoko Nishi and Chie Chang. Also featured is a moving solo improvisation by Kanoko Nishi, an expressive ode to her newborn daughter Uta. Mystical and adventurous, at times playful, this music offers a fresh take on traditional Japanese musicality and themes and can send the listener on a voyage to "Ancient Times" and distant places. But it does more than that, it belongs to the now and speaks within a modern dialog of sounds, vibrations and emotions, pushing the envelope when needed and otherwise letting beauty speak for itself. 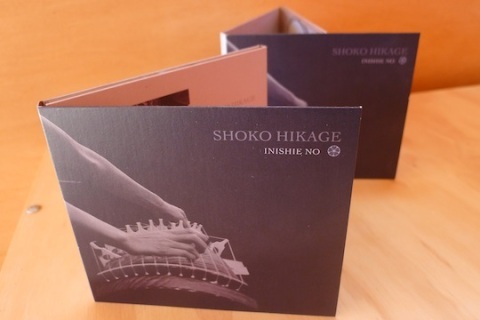 Traditional and Experimental Koto Music by Shoko Hikage. Digipack, printed on recycled paper. Shipping is included for USA and Canada only. Additional shipping charges apply for other countries.